2018 served as their most jam-packed year to date, with the band scoring an opening slot at Falls Festival after a triple j unearthed win, as well as supporting USA legends Cloud Nothings, and Aussie heavyweights British India, The Hard Aches, Alex Lahey & WAAX. Off the back of their grippingly honest millennial fan-favourite ‘Neighbourhood’, the band also delivered their engaging and animated live show to crowds at Mountain Goat Valley Crawland Melbourne Music Week. March saw the release of instant hit ‘Glue’ via the renowned Domestic LaLa 7” Club. 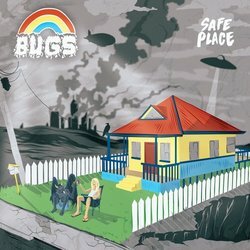 In April, Bugs released their EP ‘Social Slump’, and embarked on a huge national tour throughout May and June that took them to almost every corner of the country, selling out dates in Brisbane, Melbourne Sydney, Adelaide and Wollongong. Packed-out sets at BIGSOUND followed suit, including an appearance at the Levi’s Music Prize showcase, before hitting the stage at Beer InCider festival alongside the likes of fellow Brisbanites The Jungle Giants, Morning Harvey, and Sweater Curse. With an ever-growing slew of supporters in tow, Bugs are quickly establishing themselves as one of themost exciting up-and-coming bands the country has to offer.